This may work for some people. Check your email for a $10 off $50 purchase evoucher. They sent me one for not making any purchases in a while. 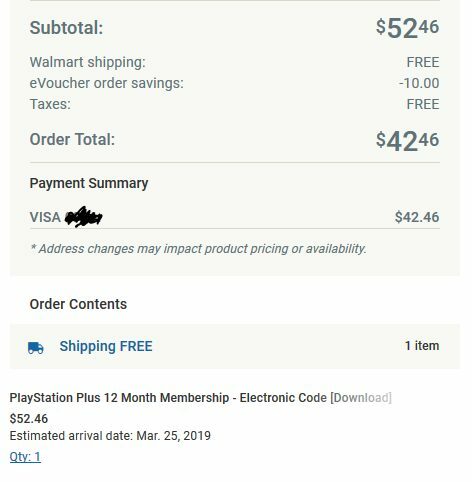 Walmart has matched the PSN 25% off for a 12 Month PSN Plus membership so it is $52.46. Use the voucher and the price becomes $42.46. No tax was charged on this purchase. Last edited by TomRFD on Mar 18th, 2019 8:43 pm, edited 1 time in total. Darn. Just checked and my email is $10 off my next $100 order. Thanks OP! Worked for me as well! So yeah, it is very YMMV. Thanks! I was looking for something on which to s’end my eVoucher... Perfect timing and hot find! I received my code already. That was a lot quicker than the estimated date. Dang, my order process changed from $42.46 to $52.46. Not sure if I should request a refund or wait as it could be a bug? 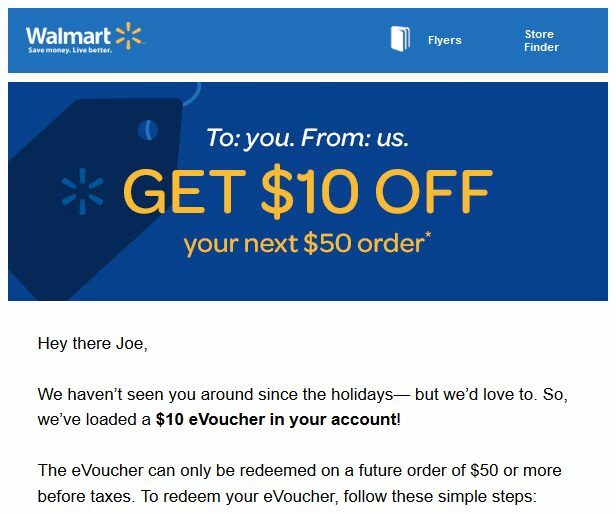 The $10 off for $50+ works for "non-grocery" items, at least that's what it says in the email. Walmart is having 25% off 12 month PSP subscription. So I tried doing this for a $50 psn card (figured why not spend $40 to get a $50 card), and they are trying to charge me HST on the gift card. Has anybody every had this issue before? $46 for a $50 card is not bad, but I was always under the impressions that tax doesn't get charged on gift cards, as a general rule -- am I missing something? yeh thats happening to me too in BC. OP is in AB so they don't get charged tax I think on this. But I think I'm gonna use my 20% off PSN store card from the Spiderman bundle to get PS Plus for $42-ish no tax. Cool i had a $15 voucher so $40.58 all in not bad.